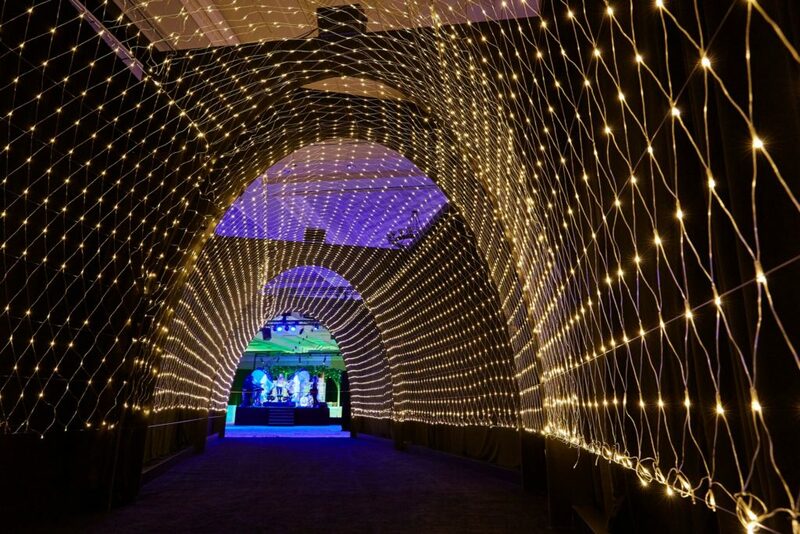 Designing a once-in-a-lifetime experience for a construction trade show exhibit is no small feat. When Caterpillar came to MC² for an unforgettable, immersive live exhibit, we knew we had to make it larger than life. 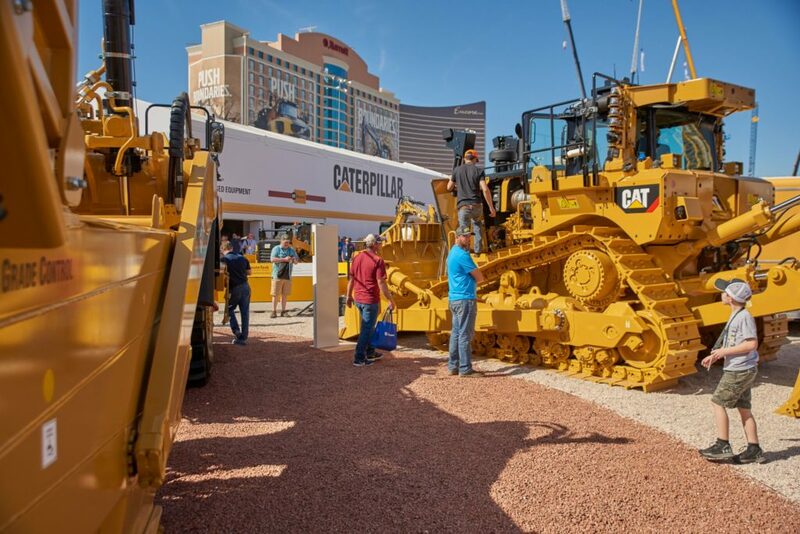 The CONEXPO-CON/ AGG Construction Trade Show in Las Vegas brings thousands of contractors, dealers, distributors, service providers, engineers and producers all to the same place. With over 2,800 exhibitors, it’s not hard to get lost in the crowd. 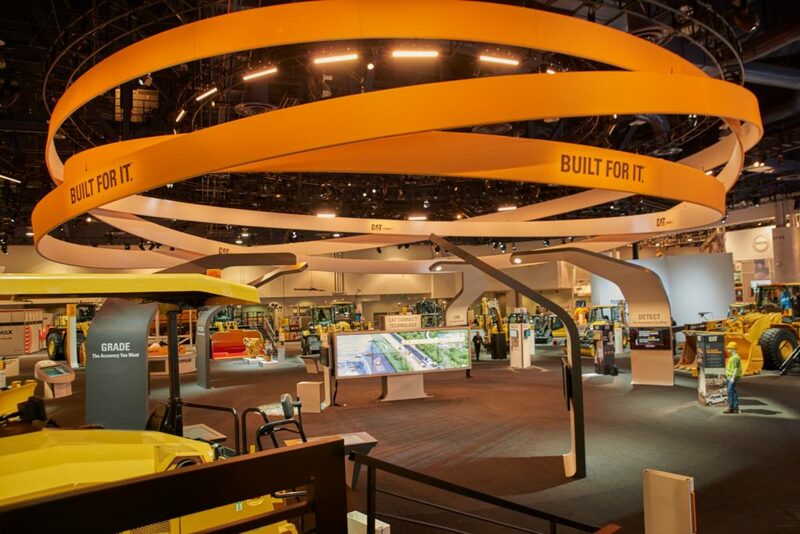 In order to stand out at the biggest construction trade show in North America, MC² designed an out-of-the-box construction trade show exhibit that would showcase Caterpillar’s uniqueness while putting all eyes on them. MC² began by working with Caterpillar’s marketing team in order to learn what their vision was for the upcoming show. In short, they needed to show the world that Caterpillar was about more than construction equipment. Although well known for their heavy iron machinery, it’s the connected technology that makes their machines more efficient, safer and smarter than their competition. As an industry leader in this regard, Caterpillar wanted to demonstrate the complexity of their technology offerings to both their existing and potential construction customers. Responding to the Caterpillar marketing team’s vision, MC² designed a clean, open approach that took visitors on a journey from simple machine to technological wonder. Picture this. 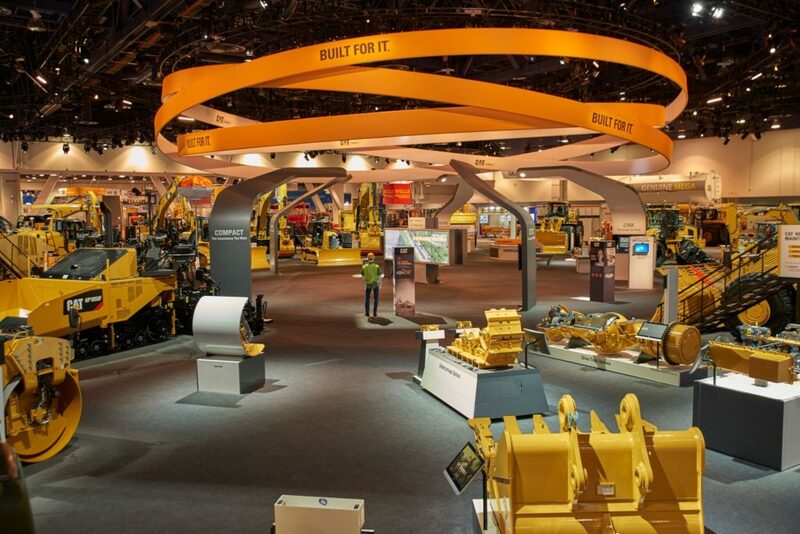 As you stroll from exhibit to exhibit at CONEXPO-CON, you suddenly find yourself lost among a jungle of yellow giants– 30 machines each weighing up to 90 tons, all facing inward, towards the center of the exhibit: you. 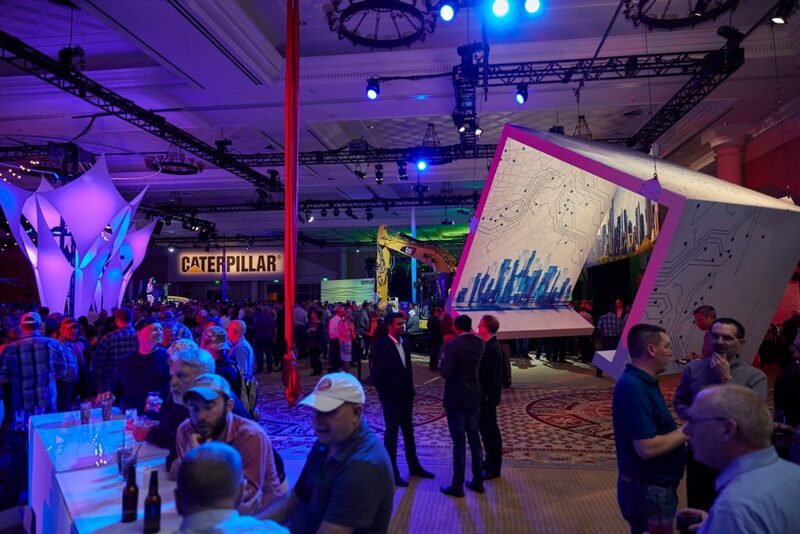 Since the sheer size and design of Caterpillar’s machinery is striking on its own, we used it to draw attendees into the exhibit where a CAT logo was visible from nearly every angle. And then we had them. Just past the machines sat a 75-ft. diameter ramped floor, framed by five monolithic “boom” structures. 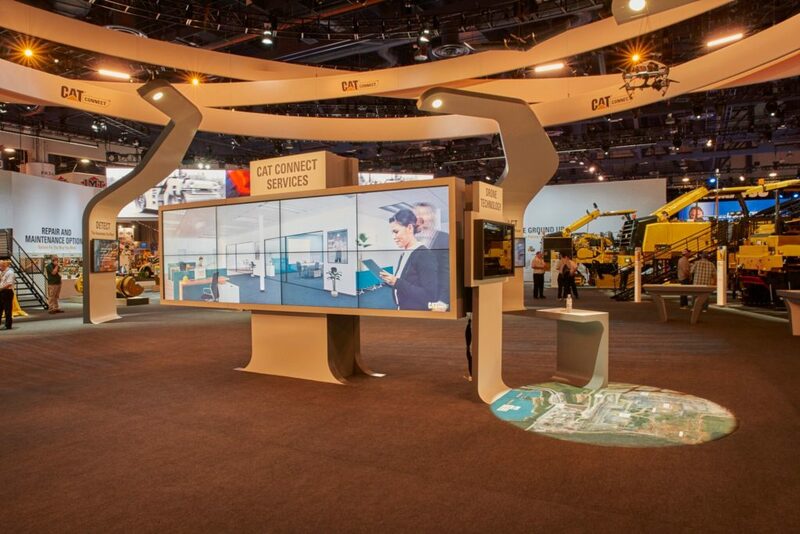 Each one held a fully interactive exhibit of Caterpillar technology products which invited visitors to test and explore the industry-leading programs for themselves. 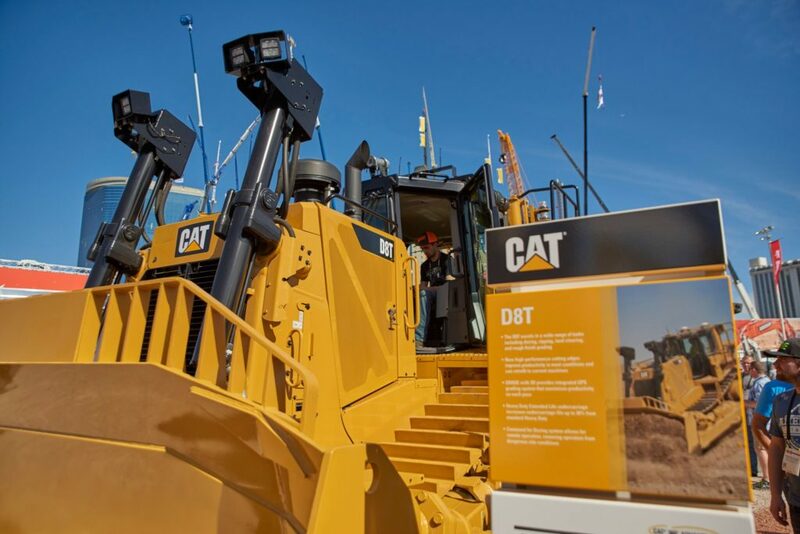 Further in, we placed drone-supported displays and demonstrations of virtual reality and facial recognition technology, hot topics that laddered back to Caterpillar’s impressive tech offerings. Framing the main event was a 69-ft. 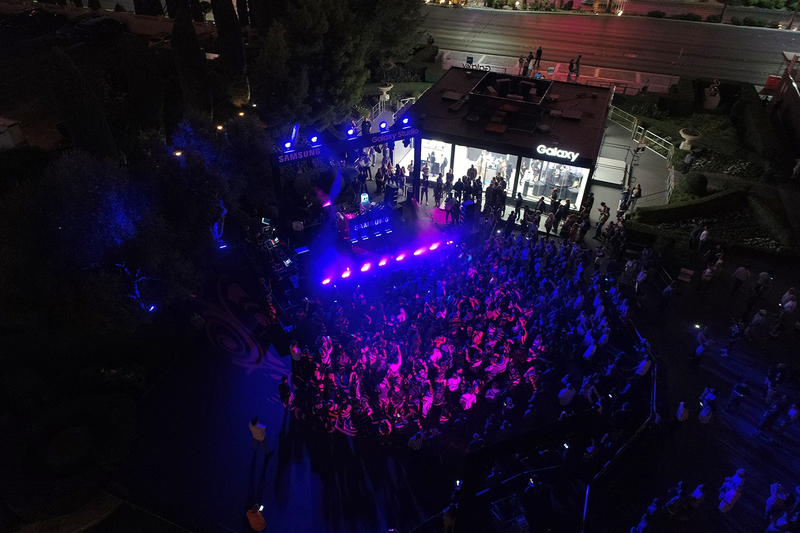 LED wall with key messaging as well as 20-ft. high Thunder walls, which blocked the visuals and noise from surrounding exhibits in order to create a separate world in which to get lost in. 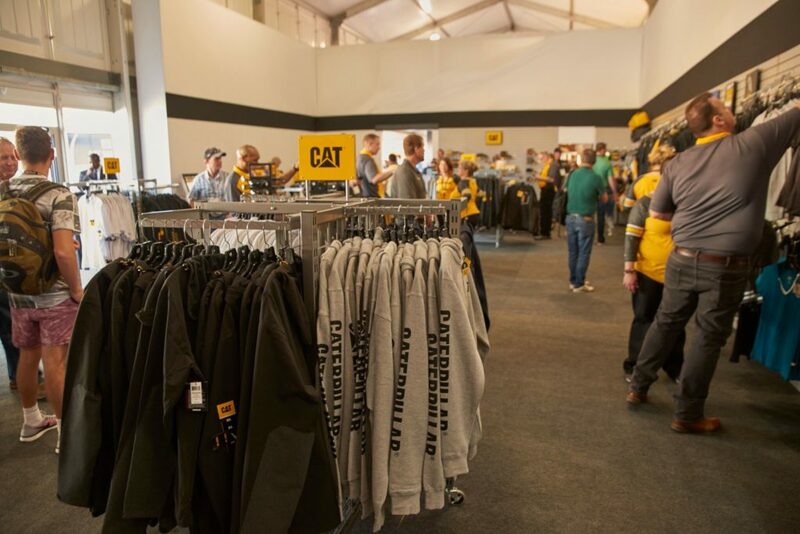 In order keep things functional and drive sales, MC² also erected a tent structure that was sectioned into two areas, one with a Caterpillar merchandise store, and another dedicated to Caterpillar’s rental and used services. Outside the tent, the connection between tech and machine became a reality. To drive home the marketing vision, we created real-life scenarios in which visitors could test Caterpillar’s cutting-edge products for themselves. At MC², we believe that at the end of the day, it’s the emotional WOW factor that makes people remember you. Without that, all of our hard work would not have had such a lasting impact. To bring a fully interactive human element into our exhibit, we built a sand pit where guests could remotely manage a skid steer through a number of fun, funny, and challenging tasks that encouraged interaction between sales staff and potential customers. Next, we set up a trailer with an even more sophisticated remote system, which attendees could use to remotely operate an actual Caterpillar machine in Peoria, IL. The work doesn’t end with the exhibit. 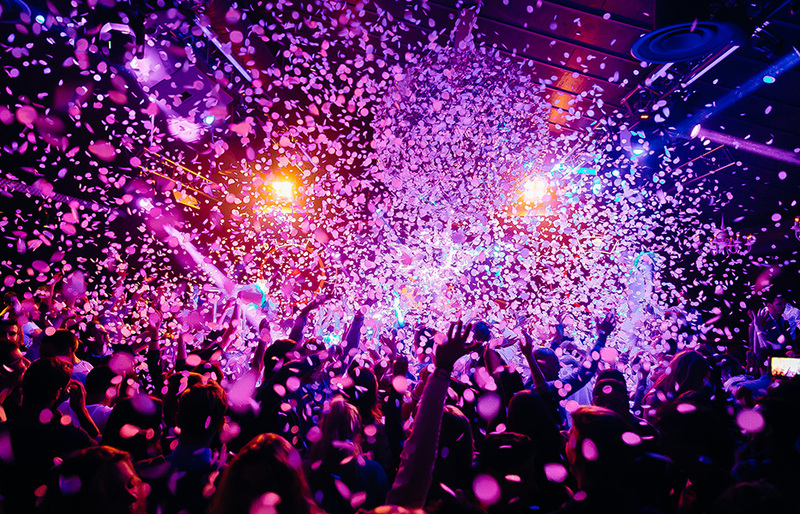 At MC², we incorporate multiple elements before and after the event that keep your company in the spotlight. 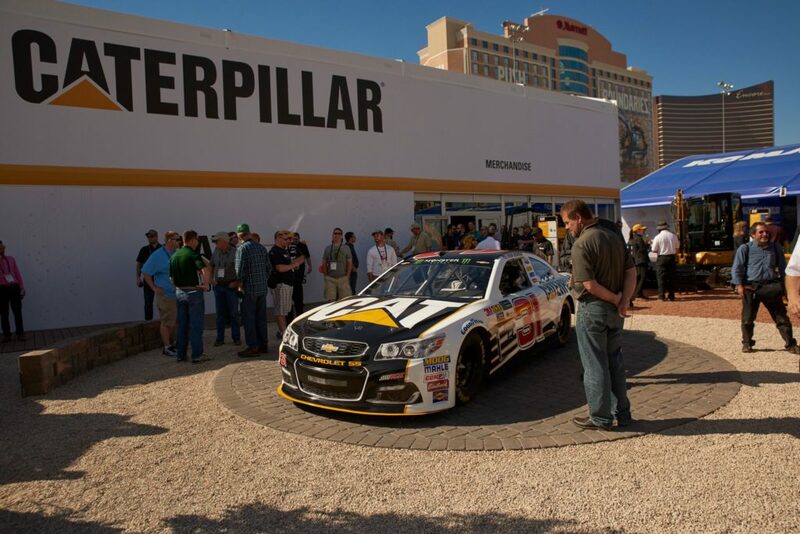 For Caterpillar, we invited the CAT NASCAR driver Ryan Newman and his team to greet attendees, hitting guests with a surprise and delight element that encouraged them to return later to see what was happening next. 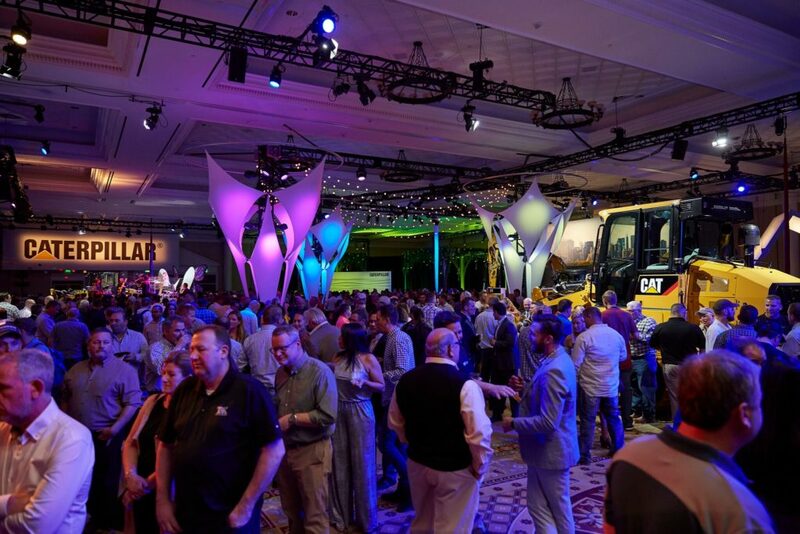 Continuing the excitement post-show, Caterpillar remained at the forefront of everyone’s mind by hosting events in the Forum Ballroom at Caesars Palace. The first was a VIP event, followed by two Customer Appreciation nights. The entertainment featured Vegas entertainment at its best, a live musical performance, a DJ, eye-catching silk performers, and of course, magicians. Are you planning a trade show exhibit or a full end-to-end experiential program? 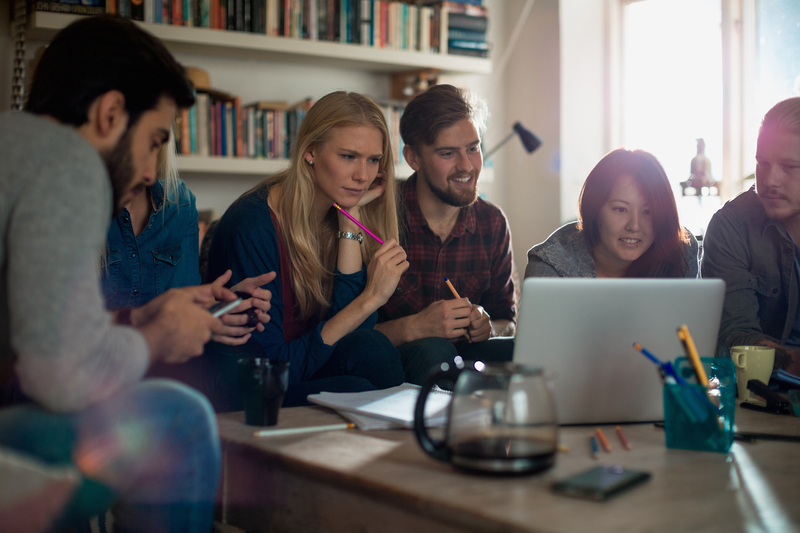 No matter your budget, or how you want to position your unique product, MC² is here to make it amazing. 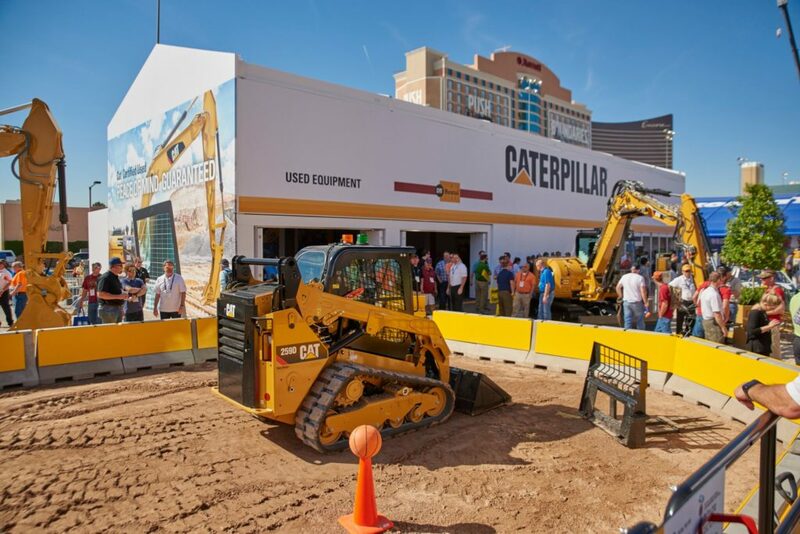 We received your request for “Built to Wow: Caterpillar at CONEXPO-CON”.